My partner Nancy belongs to an online chat group of professional gardeners, landscape designers and garden writers from across the country. Recently, they talked about sources of quality growing information provided on seed packets and in seed catalogs. Here's the skinny from those who know how to grow. For quality of information printed on seed packets, Renee's Garden is a favorite. Renee's Garden does not put out a paper catalog, but you can find her entire collection online at www.reneesgarden.com. The following paper catalogs also topped the list for quality growing information. These seed houses also grow their selections in their test gardens. Nichols Garden Nursery, (800) 422-3985; www.nicholsgardennursery.com. Catalog is free. Specializing in seeds and plants of herbs, veggies and flowers, this catalog is packed with tips on growing and using plants for cooking and other fun things. President Rose Marie Nichols McGee is co-author of the best-selling book, "Bountiful Container." Check out her blog at www.nicholsgardennursery.wordpress.com/ for gardening tips and recipes. Johnny's Selected Seeds, (877) 564-6697; www.johnnyseeds.com. Catalog is free. 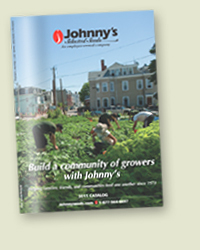 Johnny's, another favorite of garden writers across the nation, specializes in cold-tolerant vegetables, flowers and herbs that are flavorful, disease-resistant and good producers. It's a favorite of market gardeners and home growers alike. Here are some other seed catalogs you might enjoy. La Jardin de Gourmet sells small seed packets bargain priced at 35 cents each. (802) 748-1446; www.artisticgardens.com. Burpee: (800) 888-1447; www.burpee.com. Catalog is free. Seeds and transplants of flowers, herbs and veggies. Always new varieties and old favorites. Thompson & Morgan: (800) 274-7333; www.thompson-morgan.com. Catalog is free. Its 200-page seed catalog featuring hundreds of full-color photos is a great reference if you're into flower power. Peaceful Valley Organics: (888) 784-1722; www.groworganic.com. Catalog is free. PVO offers a huge assortment of heirlooms and organic seeds including Seeds of Change. Lots of Earth-friendly garden supplies. Pinetree Garden Seeds: (207) 926-3400; www.superseeds.com. Great prices for those who don't need scads of seeds. Excellent selection. Seeds from Italy: (781) 721-5904; www.growitalian.com. Catalog is online only. Bill McKay offers seeds of more than 350 varieties of Italian vegetables, herbs and flowers. Packaged in Italy, they are the real deal when it comes to growing Italian. Quarterly newsletter is a good read.